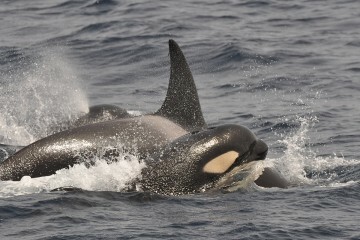 Possessing one of the largest brains in the animal kingdom, killer whales have used their remarkable intelligence to develop numerous hunting techniques. In Norway, groups of killer whales cooperatively hunt schools of herring by stunning the fish with a hard thwack of their tail flukes. In Argentina, fully grown killer whales temporarily strand themselves on sloping beaches to grab unsuspecting sea lion pups playing in the surf. But in Alaska, killer whales have taken their smarts one step further and have figured out how to score an easy meal from commercial fishing boats. Western Alaska holds one of the densest resident killer whale populations in the world with around 1,500 individual whales. 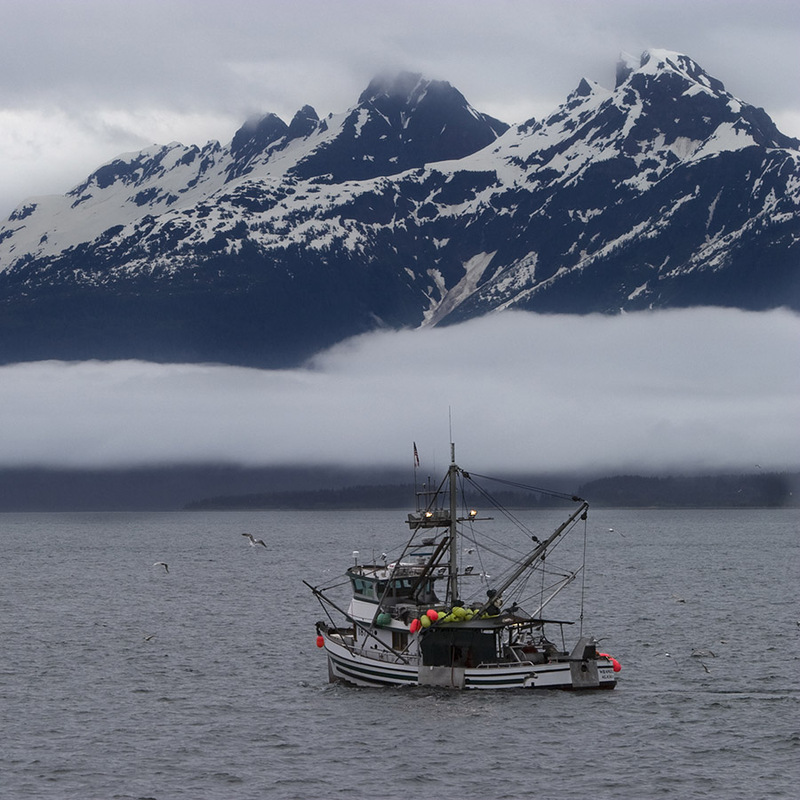 This region is also home to bustling commercial longline fisheries for valuable species such as Pacific halibut, Greenland turbot, and sablefish. 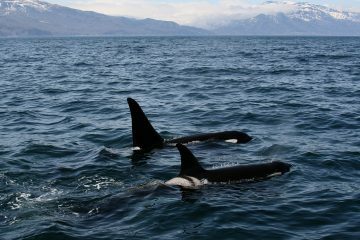 As a result, Alaska’s killer whales have figured out how to carefully remove fish from the hooks and get free dinner. 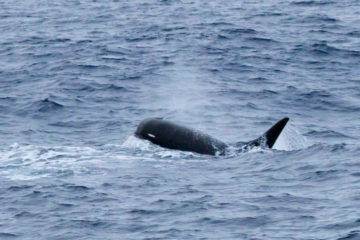 Depredation by killer whales in Western Alaska was first reported by Japanese longline fishermen in the Bering Sea in 1960 and has continued up to the present day. Longlines target bottom dwelling fish on the ocean floor and contain thousands of baited hooks that can stretch for several kilometers. Killer whales, being unable to dive to the depths at which the lines are set, simply wait for the gear to be pulled in and start to pick fish off the hooks when the line reaches about 150 meters or less in depth. They’ve become exceptionally talented at stealing fishermen’s catch; they can consume or damage up to 70-80% of the fish on a single set. A 2017 study found that catch rates of sablefish in the Bering Sea were found to be reduced by 45-70% due to killer whale depredation. 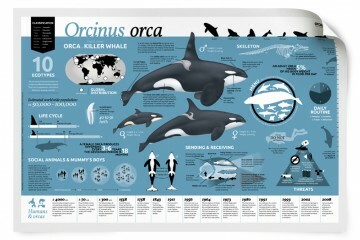 And it’s not just the fisheries species the killer whales will target. Some groups of killer whales, dubbed “trawler trash” by researchers, have been known to line up near the boats and consume the unwanted bycatch dumped overboard by the fishermen. It is speculated that the high population of resident killer whales in Western Alaska may be supported due to these year round, easy meals. However, with great reward comes great risk. While a free meal from a longline is nutritionally and energetically beneficial for a killer whale, it can be a dangerous endeavor. Fishermen have been known to retaliate against thieving whales with lethal force. In the 80s, killer whales in the Gulf of Alaska were to blame for reduced sablefish catches. 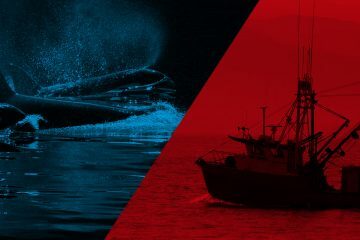 In an effort to stop the whales from stealing their catch, fishermen would shoot the whales with high-powered rifles and detonate underwater explosives next to them. 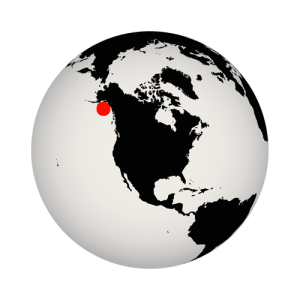 A single resident pod in Prince William Sound, AB pod, was thought to be solely responsible for the sablefish depredation. This pod also experienced unusually high mortality rates at this time. Some of the deaths were attributed to the devastating Exxon Valdez oil spill in 1989, but several of them were thought to be caused directly by the wounds received during fisheries interactions. 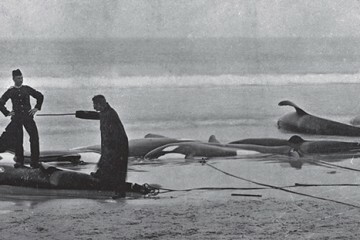 13 whales were observed with gunshot wounds; four of these died between 1985-1986. 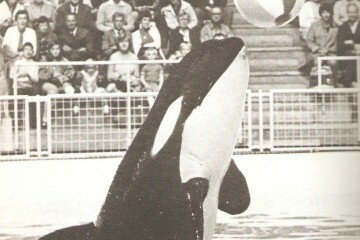 Two other whales, one with a noted gunshot wound, died between 1987-1988. Both deaths were assumed to be caused by the fishermen. These whales were young and should have been in their prime years, so there are few other reasons that could explain the numerous deaths during this time frame. Until 1987, there were no rules regarding what the fishermen could and could not do when it came to protecting their catch. The National Marine Fisheries Service (NMFS) decided later that year that fishermen were no longer permitted to use lethal force against the killer whales, and Congress amended The Marine Mammal Protection Act in 1988 to outlaw the intentional killing of any cetacean in the United States. 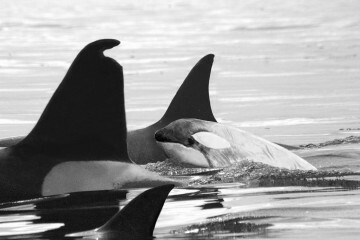 Despite these new laws, the shooting continued, and researchers documented new bullet wounds in seven out of twelve resident killer whale pods in 1992. 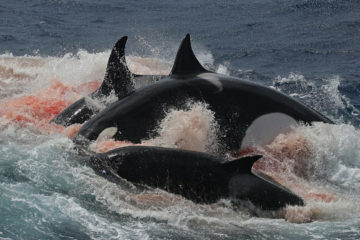 Additionally, it is likely that the number of killer whales that were shot is higher than documented. 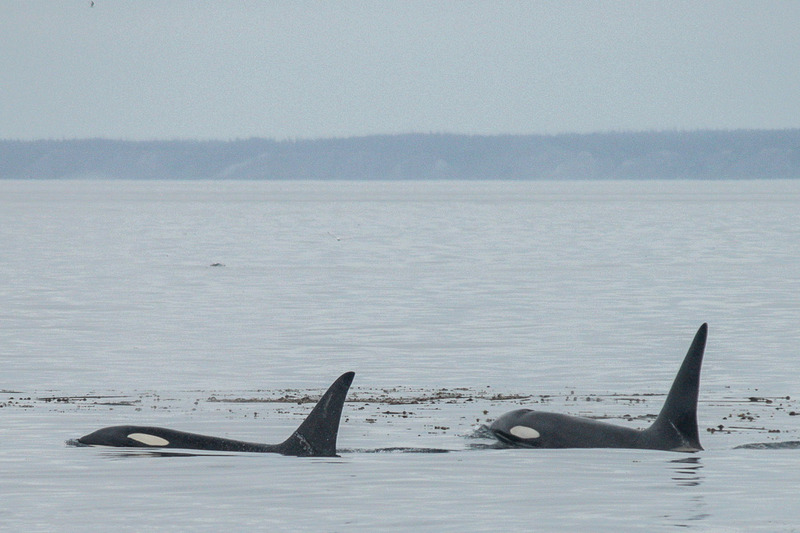 Killer whales may have died before being documented with gunshot wounds. The skin of cetaceans heals very quickly, and superficial wounds caused by bullets may have healed over before being noticed by scientists. 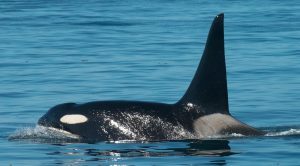 Biologists document individual killer whales by photographing the dorsal fin and saddle patch from the left side of the animal, so any bullet wounds in other areas of the body may not have been noticed. 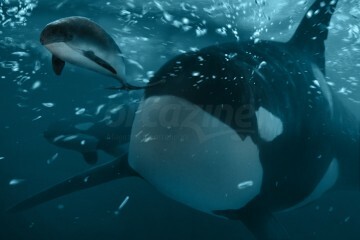 Angry fishermen are not the only threat to killer whales that decide to grab a free meal. 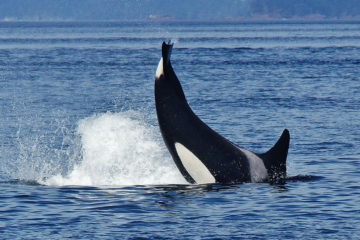 The fishing gear that provides nutritious snacks for killer whales can be deadly itself. There is a risk for entanglement in the line. In 1991, a dead killer whale in the Bering Sea was found floating at the surface, entangled in a longline. An entangled calf was also discovered, but luckily was still alive when found and was released. Ingestion of fishing gear is also a very real danger. On August 26th , 2005, a dead juvenile female killer washed ashore in Glacier Bay, Alaska. 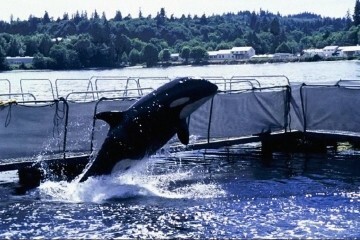 Named Keet’k’, the Tlingit word for “little killer whale,” the female was only about 18 months old when she died. 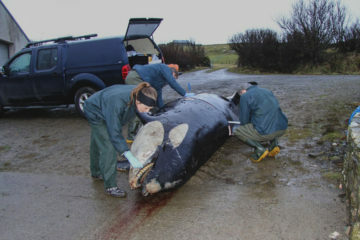 The young resident killer whale was likely from either AG or AF pod, two killer whale pods frequently found in the region. Upon inspection, it was immediately clear to biologists that Keet’k had ingested fishing gear. A necropsy revealed two kinds in her body: lightweight gear meant for trolling and gear from longlines. A hook was ultimately the cause of this little whale’s untimely death; one of the hooks she swallowed had pierced her throat, which allowed pneumonia and blood poisoning to set in. 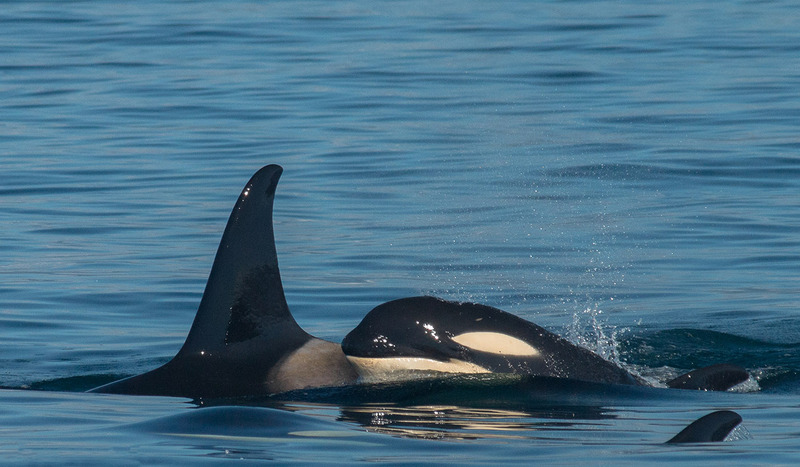 Adult killer whales, luckily, seem to be adept at removing fish from longline sets without taking the hook with them, but freshly weaned calves learning how to manipulate solid food may not be as skilled as their grown family members. For fishermen, the sight of killer whales on the horizon is a nightmare. Once the whales start plucking fish off the lines, there’s not much that can be done except watch them steal thousands of dollars’ worth of fish. Studies conducted in Western Alaska have shown that sablefish boats pay an extra $1,000 a day per vessel for fuel, food, and lost time caused by killer whales. From the years 1995 to 2014, killer whales consumed between 1,251-2,407 tons of sablefish from longline vessels in Western Alaska. With the price of the fish reaching up to $12 per pound at market, theft by killer whales is a real financial issue for Alaskan fisheries. What are some solutions for this growing problem? Many tactics to reduce depredation have been tried with a range of effectiveness. Fishermen have put out blank sets with no bait in an attempt to confuse the whales. This has no effect; the whales immediately seek out the vessels that have live fish on the lines. Seal bombs thrown at whales only startle them momentarily before they continue to feast. Switching to night fishing does nothing to hamper the whales’ efforts and only adds increased risk for fishermen working in dark conditions. Simply outrunning the whales is shown to be effective, but only if boats go more than 60 miles, burning expensive fuel in the process. Switching the target fisheries species to Pacific cod, which killer whales do not seem to have a taste for, has also had success. One method that has been suggested is stuffing decoy fish with lithium chloride, a very strong compound that produces a vomiting reaction, in order to deter the whales from feeding on the fish. 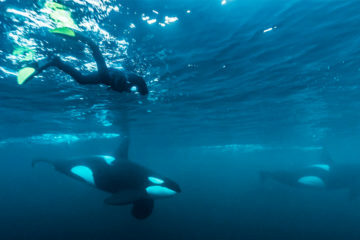 However, some researchers caution against this, as the use of lithium chloride in commercial species that are also natural prey items for killer whales may condition the animals to avoid free-swimming fish. Additionally, should any of the compound end up in fish bound for human consumption, there could be health hazards. A more promising deterrent that has been implemented in Canada, and more recently, the Bering Sea, is the use of trap or pot gear to harvest sablefish. No killer whale depredation has been reported when this gear has been used. In 2008, NMFS permitted the use of previously prohibited longline pot gear for sablefish in the Bering Sea in an attempt to reduce fisheries interactions with whales. However, switching to new gear can be financially prohibitive for some fishermen and it may be difficult for smaller vessels to use pot gear as opposed to traditional longlines. The struggle between the fishermen and the whales will likely continue in Alaska’s waters until a permanent solution to killer whale depredation is discovered. 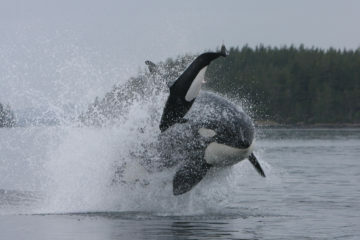 Killer whales are wonderfully smart creatures that outwit almost all challenges we throw at them. It is essential that fisheries managers, biologists, and longline fishermen work together to find solutions that are feasible and safe for both the fishermen and the whales. Alaska’s fisheries are worth billions of dollars and employ nearly 100,000 people, and the value of killer whales themselves is priceless in countless ways. It is vital that we protect both the fisheries that sustain the economy and Alaska’s killer whale population. Emma Luck is an undergraduate student studying marine biology at the University of Alaska Southeast in Juneau, Alaska. Her primary interest is marine mammals and her research is focused on killer whales in southern Alaska. 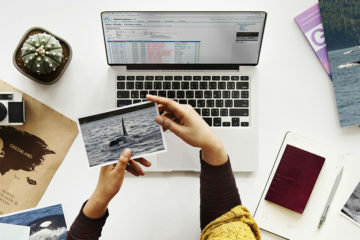 During the summer months, she works as a marine naturalist in Homer, Alaska and collects identification photographs of both the killer whales and the humpback whales that are found in Kachemak Bay.